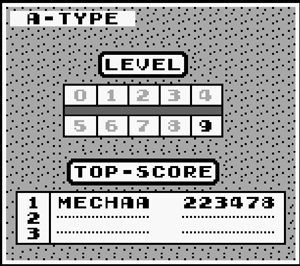 Inspired by Bosman v Wozniak, I dug up my copy of Tetris and the Super Gameboy, and have been playing a bit every day to see if I could improve on my own scores. If anyone is interested let's keep track of our scores here, as we aim to topple the Sultan of Smug, Kyle Bosman. My high score for today was 52157. I think anything below 200k we can go by the honor system, but if you're getting close to Bosman's scores, we need some proof. Remember, it's original Tetris only. lol i'd be down for this, happy to post my efforts on youtube as proof lol if i got anywhere close! A screenshot or offscreen pic would be fine too, I think. I'd have to do that anyways, since I don't have capture equipment. Just do something like putting a thumbs up in your picture so we know it's for this. I doubt many allies have an Electronika 60 lying around to play literal OG Tetris. Anyone got a link to a GB Tetris emulator? Original for anyone who isn't Russian, anyways, lol. @Minamik I've been doing this too but on DS Tetris :slight_smile: I'll have to dig around to find my old copy and play along. Man, thought I was the only one who got in to Tetris heavy because of Bosman. Topped out at 360 thousand and 206 lines. I'm not into it heavy, lol, but I will play it a few times a day. Forced to emulate but played along tonight. Best I could muster was 129490. @Dirokia I think it's only fair to Kyle, that we play the same version. Bummer, guess I'll track down a GB copy then. @Dirokia Well, you can message Kyle and see if he's cool with it. I think he'd probably be fine as long as you can't do holds. I asked and have been researching differences, but I'm not coming up with much. I'm getting the feeling that this game might be easier in some way though, either more generous scoring or easier controls. Been getting some reps in, mostly during long car rides, and got a high of 347065 pretty comfortably with 206 lines. If you don't have the original copy, just emulate like Kyle does. Best so far... I gotta say, I'm really appreciating how good Kyle actually is because GB tetris is really hard. Level 18, 187(?) lines. As a tip, NEVER think "I'm having a good run here" because I swear, this game knows it and starts throwing the pieces you don't want! @Mechanoid Remember, we welcome jinxes!